Applying for a visa to Vietnam is very easy. Let our team help and support you through the whole process. Most country can apply for evisas or online visas to Vietnam. There are mainly 4 classification of nationalities. You can an find updated information on our order form. Difficult countries or full restrict countries are difficult to get visa in general. Most likely, yu hvae to apply at the nearest Vietnamese embassy. The process is more complex. Semi-restrict countries are countries under restriction or often change in regulation. Additional price will be added. Visa online is off and on regularly. Some restrictions, are countries less restrict, but still demand more paperwork from agencies and customer. Easy countries, are the easiest and simplest. Most available visas type. To get updated info about your country and its status, please check our online order form. Under step 1 and 2, you find all guide and notice. How to get a Vietnamese visa and where to apply, depends on your travel plans. The most convenient and cheapest way. Fast, simple and secure. Read more below. The Most expensive, long processing time and not convenient. Expensive, hassle, queues and the least convenient. Cheap, less hassle, less queues and convenient. To get a Vietnamese visa on arrival/landing visa/e-visa, you can apply online through www.vnvisa.com. It’s very simple. This is a service supported by the Immigration Department. It is only applicable for visitors by plane landing in one of Vietnam’s international Airports (Hanoi, Ho Chi Minh City or Danang). then proceed to payment. We will process the application immediately (within Vietnamese office hours) once payment is confirmed. Within the chosen processing time, you will receive your approval Visa letter issued directly by the Immigration Department in Vietnam. This letter confirms that you have been approved to get a Vietnamese Visa when landing in one of the Vietnamese International Airports. Print it out and bring the approval Visa letter as a travel document. Once landed go straight to the Landing visa/Visa on Arrival counter. Submit the Vietnamese approval letter together with your passport (need to have a blank page available), two passport sized photos with a white background and Stamping Fee for Visa on Arrival/Landing Visa counter at the airport. The visa will be stamped into your passport within a few minutes. Please note that there is no ATM inside the airport. Read more about the fees. Make sure your name is exactly as on your passport and that all the information is correct e.g. name, middle name, last name, passport numbers etc. Only travelers by air and nationalities regarded as easy and safe by the Vietnamese Immigration department, can apply for this visa type. If traveling by land, you can apply for “visa code”. If travel by sea, then send us an email for more details. United States, Canada, Australia, UK, Germany, France and most countries in Europe, Asia, Oceania and Northern America are regarded as easy countries by the government. These countries can apply for pre-arranged Vietnam visa on Arrival. You can find these countries in the online order-form, when applying. We help and guide each and every customer carefully every day, 24/7. Satisfaction, low price, reliable and trust are our keywords. Give us feedback, so we can be even better. Or better, to be the best. Take no chance, we don’t. 100 % successful rate. Note: Have your passport details ready before ordering. Make sure all the information is correct filled out. Once your application is processing at the Immigration Department, we cannot correct any errors in the information provided. If you spot any errors done by us or the immigration department, in your application, please contact us immediately through chat or e-mail. We can only guarantee correction within 48 hours prior to landing at a Vietnamese International Airport. We do triple-checked all received information and orders for your safety. You can always check your processing status directly on www.vnvisa.com. For further details please read about the Frequent Asked Questions (FAQs). This process is the most expensive, has the longest processing time and is less convenient than applying Visa on Arrival online through VnVisa.com. As shown below you need to hand in your passport and wait about 5-10 working days. This service is for travelers who wish to have a regular visa in the passport before traveling. You need to hand in your passport to your local travel agency or a copy of your passport. Hand in 2 Passport photos. Service fee for the travel agency (which is more expensive). Secure Postal fee or direct submission. The overall processing time is at least 5 working days from the embassy in addition to the postal service time. Additionally you need to drop by your local travel agency to get your passport with the visa stamp. Many travel agencies offer Vietnamese visa included in your flight bookings, ask for the offer. Our recommendation is to apply through our Secure Online Visa application if you wish to obtain your visa fast and smoothly. It is very simple. We guide and help each and every customer carefully. Once the application is filled out and payment is settled, we will rush to process your application through the Vietnam Immigration Department. You will get your approval Visa letter within the chosen processing time (from super urgent ½ day to normal 5 working days). You are then ready to travel to Vietnam. You will get your visa stamp at the Vietnamese international airports Landing Visa counter. There are more steps, long processing time, more expensive and most hassle. A Visa to Vietnam can be applied for by mail or in person at the Embassy of Vietnam as early as six months prior to the date of travel. The closer the embassy is to Vietnam, the shorter the processing time will be and the lower the price it is. Cambodia and Thailand are the lowest, but visa on arrival is even lower. It is processed directly at the Vietnamese immigration department in Vietnam. 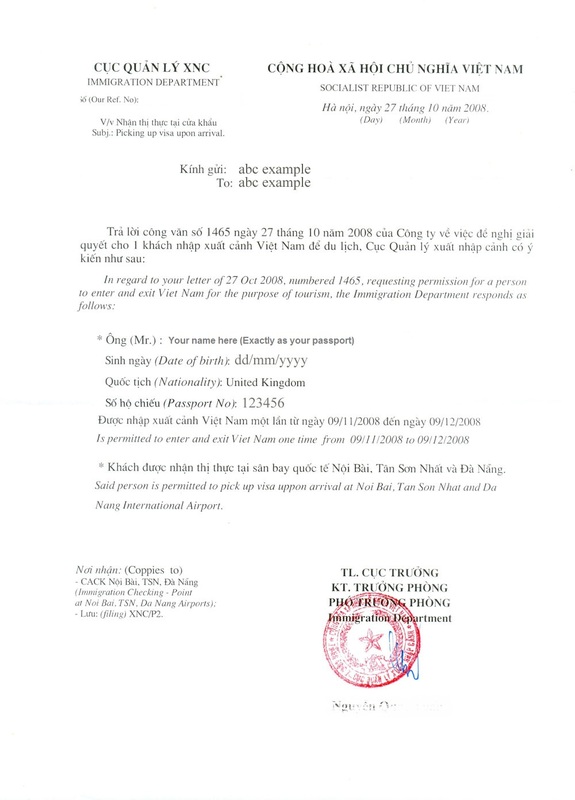 Original passport (which requires at least 1 month validity prior the date of exit from Vietnam and/or 6 months validity to meet airline requirements). One valid blank page in your passport is needed. In urgent cases a loose leaf visa can be requested, a copy of passport (photo and personal detail pages) may be submitted instead of the original passport. Application form. The form must be completed, signed and attached with 1 passport photo. In case of a loose leaf visa request 1 additional photo must be stapled to the form. shipping, handling and expedite services) may be looked up at the embassy. If you apply direct at the embassy you need to come back, wait in queue in order to get your passport back. Or wait for the postal service. At least 5 business days are required to process visa applications in addition to the postal service. Expedited processing requires one to two business days after the Embassy has received the application (additional fee required). Telephone inquires regarding the status of your application at the embassy can only be done (make sure that you keep your passport number for this request) until after the 3rd business day for an expedited case and the 7th business day for a regular case. The Embassy will be closed on Saturday, Sunday, Vietnamese and local holidays. Please take in account the observed holidays when planning your visa application and travel. In addition no mail can be delivered at the embassy during weekends and holidays. The applicant is responsible for checking that the information on the visa issued by the embassy is accurate. In case of inaccurate information please contact the Embassy immediately for correction. Otherwise the applicant is fully responsible for incorrect information. For further information please contact the Visa Section at the Embassies. The process may varies, depends on each embassies. Note: Check the openings hours. They often have very short and strict opening hours, especially in Asia. To get a Vietnamese visa code, you can apply online through www.vnvisa.com. It’s very simple. This is a service supported by the Immigration Department. You get the visa stamp at the chosen embassy or consulate, instead of getting the visa stamp at the airport. The process is similar to Visa on arrival. Get the Vietnamese visa pre-approval letter by filling out the secure online form then proceed to payment. We will process the application immediately (within Vietnamese office hours) once payment is confirmed. Remember to write in the order note or send us an email: “You want visa code” and the embassy you wish to get the visa stamp. Within the chosen processing time, you will receive your approval Visa letter issued directly by the Immigration Department in Vietnam. The same letter will be sent by us to the embassy of your choice. This letter confirms that you have been granted a Visa and you can get it at a chosen embassy. Print it out and bring the approval Visa letter, the stamping fee and passport picture to your re-chosen embassy and get the visa stamp in your passport right away. Please note that it is ONLY possible to get the visa stamp at your chosen embassy. Make sure your name is exactly as in your passport and that all the information is correct e.g. name, middle name, last name, passport numbers etc. Once you have had your passport stamped with the visa you can enter Vietnam by land, sea and air. Once your application is processing at the Immigration Department, we cannot correct any errors in the information provided. If you spot any errors done by us or the immigration department, in your application please, contact us immediately through chat or e-mail. We can only guarantee correction within 48 hours prior to landing at a Vietnamese International Airport. You can always check your processing status directly on www.vnvisa.com. For further details please read about the application process under section Frequently Asked Questions.